Blunt-spoken and fiercely independent, but with the softest of hearts, Alice Redman Gooch enjoyed life to the fullest throughout her almost 92 years. The daughter of an inventor, Mrs. Gooch was educated in the United States but settled in the St. Catharines area. She had some inherited wealth but also worked as an interior decorator, and started a packaging and storage service for frozen goods. She was married only briefly and had no children. Her friend Maureen Raham remembers with admiration a woman who could fly a plane, produce beautiful needlework, drive a sizeable motorboat, and who once took a mechanic’s course so she could make sure “no one will pull a fast one on me” when she took her beloved Cadillac in for service. She also remembers her friend’s love of community, her many volunteer efforts, and her quiet financial assistance to both organizations and individuals. 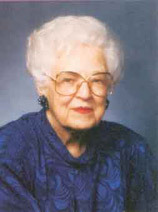 Alice Gooch planned her estate with community interests in mind. Back in 1990 she took out an insurance policy and made Hamilton Community Foundation the beneficiary. When she died in July 2004, other beneficiaries of her estate included the Niagara Community Foundation, Brock University, Niagara Children’s Safety Village, St. Catharines General Hospital and the Niagara Peninsula Children’s Centre.